We have long known that VI Analyzer is a good idea – much like unit testing – people on the other side of adoption swear by it. We’ve found a few hurdles for mainstream adoption into our process, and I suspect yours too. The first step in adopting VI Analyzer (and keeping that adoption going) is understanding why you are doing it! What I mean by this is you need to make the tool fit your process – not the other way round. If you use VI Analyzer because NI says so then you’re going to see less benefit and it will feel a lot more effort. For me – I believe that consistent style and code inspection reduces bugs and improves readability of the system. I have a style guideline, but I don’t always follow it. As I typically work on my own, then code reviews aren’t an option. Your “why” will probably be very similar but the subtle differences will make some of the following items slightly different from mine. As I said above, VI Analyzer is all about consistency for us. We want every project to follow the same style guidelines. Unfortunately, VI Analyzer does not make it very natural to create a standard test configuration and share it between projects since there is a single configuration file for test setup and which VIs to test. Start with your style guidelines. I made mine into a table and identified what already had a VI Analyzer test, what had a custom test in the community, what could have a custom test and what was not testable. I downloaded the custom tests that are available online and created a couple of key tests myself. I didn’t do them all, and I will expand my coverage over time. I used a project to create a VI Analyzer configuration file. I worked through the tests and configured them to my style guideline. Then I removed all of the VIs to be tested. I saved this configuration file as my standard. By completing these steps up front, I can introduce a consistent VI Analyzer configuration to a new project quickly and easily. Post-Commit in a CI Server – I’m not a big fan of this one because you now need another trigger to review the results and implement the changes. Pre-Code Review – This is a great one if you are on a team. You should test with VI Analyzer before a code review. You don’t want to waste time picking up things a machine can identify faster. As I am a solo developer, this one is limited for me. Feature Branch Merge – If you are using a branching workflow in Git or Mercurial, then you can use a feature branch merge as a trigger. This is a good trigger as it should limit the scope of what needs testing. However, if the change list gets long, then there could be a lot to review. I wanted my trigger to be a commit. I feel like the code should go through VI Analyzer to be “finished” and only “finished” code should be committed. This is a problem though. Analyzing a whole project can take many minutes, and I might commit 10+ times a day. One way to solve this would be to test only changed code, but VI Analyzer lacks any native support for this workflow. I have developed a tool to tie it to git changes. It isn’t great, so we haven’t shared it yet (it still lacks many essential features), but it has started us using VI Analyzer regularly. This tool will take a configuration file and then run it against only the code that Git shows as changed. Testing only the changes cuts the test time and now means that it is possible to check at each commit and fix the changes before that commit. By overcoming these hurdles, VI Analyzer has become a standard part of our workflow. I hope you can use this to incorporate it as well. Refactoring: When Should I Create A SubVI? I don’t write code in the best way the first time. No-one does. Instead, if we want to get to a state of clean code (readable, maintainable etc. ), we often have to put specific effort into it. Martin Fowler’s Refactoring book summarises it nicely when talking about refactoring. You need two hats. One for adding functionality and the other for refactoring. Your process may have a nice point to change hats (I use TDD which does) – or you may have to be more deliberate. But at some point, you need to think about refactoring. I’m not going to go into loads of detail on refactoring now. Instead, I want to focus on one type of refactoring that I use a lot – creating more subVIs. Why Refactor Code to have more subVIs? The diagram is smaller – The simplest of them all – your diagram now fits on the screen! Improved readability through abstraction – This can be a contentious point. We are putting the detailed implementation another click of the mouse away which some people dislike. My experience is that this is outweighed by how much easier the code is to read. By creating a well-named, cohesive subVI, the calling VI is faster to read since you don’t have to worry about the details. You can worry about the problem it is solving and dig into the details if/when you have to. There are also testing and debugging advantages since the new subVI can be debugged in isolation. Clear and Obvious Coupling – Coupling is one of the primary concepts in software design that you need to grow to understand. A flat diagram can easily hide coupling in the noise, but once you create subVIs, it is obvious if a subVI has too many inputs or inputs that you wouldn’t expect it to have. These are both signs of coupling problems. I signed up for a presentation at NI Week to talk about clean code and needed to talk about this topic. The day before planning to write the subVI section, I was working on a customer project. As I have a young baby at home, I try to leave at 5 pm every night now, but it was getting on for 5.40pm, and my Wife was messaging me to see where I was so I got the code running but never put on my refactoring hat. When I came to write my presentation, I realised that stepping through the refactoring of this code was the perfect example! The code I abandoned that evening is the code in the steps below. The first and simplest clue, is to look for sections of code with comments describing what they do. If it is enough of an important chunk to comment, it is probably cohesive enough to make a good subVI. See the sections for formatting at the bottom? There are three types of data to be formatted for the table. One is already in a subVI but the other two are just labelled as doing the conversion. This is the classic sign of a subVI that hasn’t been created yet. The first step here is to turn these all into subVIs. I’ve created the subVIs, aligned them and given them a consistent naming convention. I’m still looking for a better term for this, but there is still a smell in the code above for me. Most of the code is now subVIs doing non-trivial functions. Loading from a log, generating tables. But there is a section on the left that is doing array manipulation. This is a problem because it is too much detail for what this code describes. This code is supposed to “say” load the data from the log, convert the sections to a table and combine them all. But instead this story includes handling memory allocation as well! So my next step is to abstract this into a more descriptive subVI. I hope you agree; this code is now much more straightforward to read. It is doing everything it was before (as efficiently as it was) but as developers, we can become faster at understanding the code. Did you notice the coupling? This highlighted a nice reason for this refactoring. Why is a build table function using an array of timestamps? Why Use Timestamps To Build A Table? We sucked these in as part of the “create subVI” process, but they don’t belong. We can refactor the timestamp array out but using the rows in the time table instead to remove the input. This is a somewhat trivial example, but by abstracting out the subVIs, we can now understand our code in a way that is clearer than before and better visualise the coupling between functional components. The build table code could be generalised for reuse by removing some of the labelling. If I need this same function elsewhere, I may come and grab this code. The program flow shown is that we generate each sub table before building a large table. It may have a higher performance to directly insert each of the subtables directly into the pre-allocated table. Right now the solution above is simpler, and I don’t have any performance concerns, so I haven’t done this. I’m going to keep on about this – These potential changes are much more obvious in the new structure than the old – that is why those first steps are important. There is also a point where you have to say good enough, or there isn’t enough information to know what is the next best step (options 1 and 2 above may clash so we don’t do them until we know which we want). Isn’t there a risk of breaking your code with refactoring? In theory refactoring should not make any functional changes to your code but we have all done things with unintended consequences! Allowing low-risk refactoring is one of the ways that unit testing leads to better code. Because I have tests around this section of code, I could change it as much as I wanted with confidence that it still works. This is why we treat unit testing as a foundational principle at Wiresmith Technology. Why Do Your Loops Run? Someone/Something taught me this – Huge apologies I can’t remember the source of this but thank you whoever you are! Its name makes something simple sound very complicated; it isn’t! A loop within an application component. It has a single reason to run. Time – Intended to run every x ms. Event – Either a UI or User Event, the loop contains an event structure. Data – Basically a queued message handler but “data” means anything that means a loop waits for data. A data interface could be queues, notifiers, streams, DAQmx etc. Some external process is forcing us to wait for new data to be available. Using the timeout on an event structure (did you know it won’t fire if user events fire, even if you aren’t handling them? Thanks Chris R for this demo!) Thanks Fab for the correction: This was a bug that has been fixed. Using the timeout of a queue to perform a repetitive action. As you can see – time is usually the conflict because the others are kind of obvious to avoid having in the same loop. Put simply, in most cases where two of these exist there is a conflict which is hard to resolve consistently 100% of the time, mostly because the event and data drivers depend on external components which aren’t predictable. Take the timeout case of the queued message handler. If you want to check a state about every 1 second, then the best case is a new external message once every 2 seconds. Then 1 second after that message arrives you perform the check. Maybe you will get a second check before the next message, maybe not. Most likely you will end up performing the check every 2 seconds. Perhaps that is acceptable? However then an external component generates messages every 0.1 seconds. Now that check doesn’t happen ever, through no fault of yours! (In the context of the code in this loop). Use a second loop as a “proxy”. For example in the case above have a second loop which runs every 1 seconds and enqueues a message for the check. Another example is when you have an API which generates messages on an event but you need it in a queue. If you have used the actor framework, this how you extend actor core for GUIs. If you don’t see a way to design around this rule, then you need to know you are breaking it and be very careful. Most likely by adding some management code to a loop. The example I could think of was if you needed data from two loops. In this case, you would write code to read from each queue. If one read timed out, perhaps you store the successful data and then try again, reading only the failed queue. I don’t think there are many cases, but rules are about knowing when you break them and why! The word of the year here at Wiresmith Technology is process. In areas where I have standardised processes life has got easier, less stressful and more reliable. Now I’m looking at the software processes to see where we can get the same benefits. Something that I have wanted to address for a while is architecture. Working on my own has given me the benefit of being able to be quite ad-hoc and try different designs on different projects. Well, I often think coming back to your own work after 6 months isn’t so different from working with someone else and I’ve certainly felt the drag of having to review how I built the architecture on each project. So I want to at least have some standard templates. What I found when I came to it was I first had to define what is in a program! There are so many conflicting terms and every framework has its own terminology. I really wanted to start with knowing what I want in a generic sense. By doing this without looking at specific frameworks it gives me the freedom to find a framework that fits the way I work best (as well as the freedom to change or not use frameworks depending on the project). I’ve seen this approach work in my business. I’ve been trying to find tools to help me be more productive, but it isn’t until I decide on what the process is that these tools are supporting, I waste hours trying to choose as I have no way to determine what is best! So before even trying to work with templates or frameworks, I reviewed my previous projects to try and pull out and name the different elements of my architectures so I can map other tools to this. So here is what I listed as my architectural definitions. Before you read them, understand I am sharing these for your curiosity – you may have your own set of definitions in your team already. This isn’t about right or wrong, this is about consistency between team members and projects. Application Component An asynchronous VI with it’s own lifetime and own control of when to run. This is the top level of the architecture design. Data A piece of engineering data e.g. acquired data. Messages: We split this concept as messages are more framework-oriented. Message A framework command for a process to do something. Data: although they are data in the strictest sense, they are not directly related to the data involved in the engineering domain. Message Handler A process that receives heterogenous messages and data. Data-driven process: this has homogeneous data to handle. Module A set of related code. In our system, it is a class. It is generally unit testable. Module (DQMH), Actor (AF) – These are processes or message handlers. Process A loop within an application component. It has a single reason to run. I’m pretty happy with this – the one element of confusion is where the actor style module (whether that is an actor framework actor or another QMH based framework like DQMH). In reality, this sits somewhere between a module and a process but I need to experiment more with how to think about those. For me the next step now is to create templates or frameworks to handle these items in a consistent way – more on that in a future post. My challenge to you is to think about this for yourself. Maybe you already have a framework so you don’t need definitions like this, but where do you find you or your time are inconsistent over time and would a common language help? The APIs that you have to test are not always simple. As well as passing data they may involve events (with the front panel or with user events). If the event doesn’t fire – test fails. If the event fires with the wrong data – test fails. Given: Who knows, in this case, a UI library has been tied to a control. When: We take some action that should cause an event on that control. A timeout case with a suitable timeout – In this case, we call the Test Case.lvclass:fail.vi to fail the test. This should never run if the when code fired the event. A case that handles the event – If you don’t care about the data then you can do nothing here, otherwise, include tests on the data included in the event. Dynamic Event Registration: If this is a user event then you will need to register for the event. I’ve included this in my template, but you must move the event registration to the given case. If you haven’t registered the event before the action in the when case, it won’t ever fire. Parallel/Dynamic Event Generation: If your event is in some dynamic code you may need to have this running. My advice: DONT. Try and pull out the internal API and test synchronously. Asynchronous testing in LabVIEW introduces timing concerns which make your tests much more complicated. If you want to use this template, or even if you are just using VI tester you can download the new version of the VI Tester Advanced Comparisons (VITAC) tool from https://github.com/WiresmithTech/VITAC/releases/tag/v1.1.0. Where Do I Save Config Files In LabVIEW? When writing applications that will be used by anyone else you will need a configuration file. In my experience, this is almost universal and the more I make configurable, the more powerful the software becomes and the less small changes I have to make for my customers. Where do we save config files in LabVIEW? The landscape is more complicated than you would think! In this post, I’m going to summarise what we do on our LabVIEW projects. We are focusing on Windows since RT is simpler (put it in /c/) and I don’t use Mac or Linux with LabVIEW. Global Data: No matter who logs into the system they should share the same configuration. In my experience, this covers the vast majority of industrial applications. User Data: Configurations that should change depending on the user. This might be screen layouts for example. Microsoft is actually quite keen that you put this data in the registry – that is what it is for. There is a Software folder in each top level folder where you should create your own Company/App folder structure and you can store settings as different variable types. Files are much easier for users to get, edit or send you. Whilst I don’t want them directly editing the files much it is great that when there is a problem they can send me a file or even a screenshot of the file (when it is readable) so I can understand their setup. Files make save as… much easier if the user wants to be able to switch between configurations. Files are universal. Although I don’t have much cross-platform code I like that I can create multi purpose configuration libraries that work on Windows or RT. Without this, I would have to have different code for the different platforms. I am curious though about who is using this. Please leave a comment below and let me know why you like this and if I have anything wrong. OK, so we have decided on files, where should we put them? Helpfully Microsoft has an article on this however 7 years on there are still issues! User data is the easiest and where Microsoft’s advice still works. In each user folder, there is a hidden AppData folder. This is designed to hold user-based configuration files and so the user has full read/write access to this. It is just hidden to protect you from “users with initiative” as Fab puts it in this presentation! Within here you should create a folder structure with Company Name\App Name to follow the standard convention. To get this path use the Get System Directory.vi with the User Application Data input. In XP all worked well. It was located under All Users\Application Data and all users had write access and software worked. Folders had restricted access. The creator/owner has write access but no-one else. One use case for this is to install fixed configurations at installation time and this works well since everyone has read access. However, if you need to write these after installation you normally do not have access. The solution to use this? You need to set the permissions as part of a post install step to allow all users to have write access to the relevant folders. One day, I may sit down and get this set up automatically as a post install step. For now, I have too many concerns about managing failures of this causing extra support. My solution? Use the public documents folder. I follow the same structure but in Public Documents instead of Public Application Data. So far I’m happy with this decision and I haven’t had any headaches due to this. I would love to hear your thoughts. What do you do? Am I wrong? A few months ago in the Austrian alps I was skiing and attempting my second ever slalom run on my trip. Those of you that I have seen recently will now it didn’t end well! I gathered too much speed, caught some ice and tore my ACL. Since then I have to do some exercises each morning to prepare it for surgery. I tend to try and watch some interesting talks while I do this and make use of my “bonus” time. They are often TED talks but I had watched many of the latest ones so, super geeky, I switched to Go To Conference talks which are software talks – mainly based around web technologies. I find it interesting to watch some of the talks that skirt the edge of the technical and understand how they can be applied to LabVIEW. This was certainly true of Level Up Your Unit Tests. The talk is somewhat the story of a developers transition to a new testing tool and there is one piece that really appealed to me. When: The trigger or action. Then: What the software/system should do in response. Given we have a high temperature alarm, when the user clears the alarm then an alarm should no longer show as active. Given is small. If it starts to get quite big this starts to sound more like an integration test and less of a unit test. 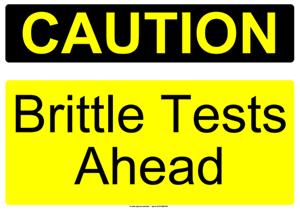 It should also contain no tests – this is not the subject of the unit test. When is tiny. This should ONLY be the code you are actually testing. Then is tiny. This contains your actual tests and assertions. Given a unit test should test one thing there should only be one assertion here or multiple tightly related assertions. What struck me was that my unit tests – while quite effective – are a mess compared to my normal code. I tend to rattle through then and not give them the full attention that they need. This can hurt me when I have to return to them to understand why they fail. So I have experimented by taking the descriptive structure of the framework that Trisha describes in the video and implementing it in LabVIEW. The idea is we want clearly separate sections for these with defined boundaries so I found flat sequence structures work well. Let me give you a (kind of) before and after. This is the old style. It works, well. However just looking at the code there are test cases spread throughout (5 in total) and it isn’t clear from the code alone what is being tested. Here it is much clearer what is just setup code, what is the code under test and then what the conditions are that we really care about. Now I really am running out of things to say on unit testing! I have a few more OO posts in the pipeline as well as a couple of tips & tricks posts that I hope to do this year. It has been very busy the past couple of months but I will be having some time off over the summer while they reconstruct my knee! So expect a few more posts then. Thanks to the commenters below I wanted to include a couple of links. Those of you that know me or have been following the blog will know that for a while now I have been practicing test driven development in LabVIEW. This is great, most of my LabVIEW projects now have 50-100 tests attached to them that check various parts of the system are working, but of course, this is only when I remember to run them! We are all fallible, when it comes to 6pm and I want to go home, I add my last flourish, commit to source code and go home, forgetting to test. I get no such prompt with LabVIEW. There have been a number of projects over the years to do this. JKI have a system that we managed to set up and get working some years ago but it depended on some intermediate files and took a bit of fiddling a couple of years ago. In order to try and make it easier, a couple of years ago I learnt some Java to try and build a plugin for Jenkins which could talk to some corresponding LabVIEW code over TCP. But it was over-complicated and I was over-ambitious and never finished it. The all-powerful command line interface! If we can use the command line, we can talk to Jenkins and any other technology which comes up for the next decade at least. The problem is LabVIEW’s command line interface is quite basic. You can recieve calling arguments but can’t recieve or send text (stdIn and StdOut) and can’t return an exit code. That last bit is critical since it is how one program determines if another was successful, therefore how we signal to Jenkins whether we have succeeded or failed our tests. JKI solved this problem through the use of batch files and text files but I wanted to try a different method. A corresponding LabVIEW library that gives us the ability to access the command line. The philosophy is that the C# application is very small but can be called directly by Jenkins or any other language and will then launch LabVIEW or our LabVIEW built application. I’m hoping that by keeping it quite simple, it can become a building block for CI tools and others for LabVIEW. So if your interested you can check out the builds on github and give it a go. I am not currently using this in anger so please don’t bet your job on it working! But early tests look good! You will need to install the C# application with the installer and then there is a vip package for the LabVIEW library. Look at the readme on github and happy building! Any issues you can create bugs on the github page or comment on the NI community page. I’ve had a few long journeys over the last couple of weeks and managed to catch up on some reading. In particular I have been jumping into some sections of one of my favourite programming books – Code Complete. As with most books, the practical techniques directly apply to text based languages. Certain things like naming conventions for variables don’t readily apply to LabVIEW since everything is graphical. However I think we need to think about text as well. It can be fast to read and unanbiguous in meaning (when done well). LabVIEW supports text documentation, mostly you interact with it through the context help window. However, as has been pointed out in the last couple of CLA Summits, we should look to reduce the amount we have to break out of our programming flow. I’ve talked about comments before, but this triggered some other thoughts. Increasingly, certainly for internal APIs I find myself mostly relying on text on the icon other than where there is a well establised precendent (Like init or close). I like this because it makes my code faster to scan, I don’t have to do the mental translation from icon to meaning if it isn’t automatic. Think about the last time you drew a flow chart? You use text because it is quick and easy to get the meaning across. (I know this has internationalisation implications, but this has not been a concern for me yet). I am also aware of an advantage that we do have over C++ and it’s fellows when it comes to writing text. We can use descriptive names for our subVIs since we can include spaces. Just because C++ has to use names like InitDaqCard() or ReadTemp() because they have to type it all the time. We can use full names for VIs like Initialise DAQ Card.vi or Read Ambient Temperature() and should take advantage of this. Well we may not name variables (very often) but controls and indicators can and should follow good conventions, with unambiguous names and inclusion of units. Like with the function names we are also not limited by text based languages naming restrictions in the same way. Reading though, the part that really struck a chord with me though is about intermediate variables. Code Complete advocates meaningful intermediate names (so not i, j for loop counters for example). This hugely impacts the readability of code. It actually goes further and suggests forgoing the performance hit and even adding unneeded variables for complex routines where they improve the readability by giving meaning to intermediate values. Again does this apply to LabVIEW? We don’t have variables? Actually we do, they are called wires. When was the last time you drew a block diagram on a whiteboard and left the arrows unlabeled? It would be hard to read but I find I rarely label wires in LabVIEW (unless they are obviously unclear) and I suspect I’m not the only one. Context to these connections greatly improves readability. Again we may have them in LabVIEW using context help as some names automatically spread from functions. But if we labeled wires more it could save you using context help, or even opening subVIs to understand what is going on. Do that a few times a day and the productivity adds up. Oh, and unlike creating an intermediate variable for readability, this comes with no performance implications in LabVIEW! I will be trying to use them more often over the next few weeks and see how much I can improve the readability of my code. Does this make sense? Or am I completely wrong? Let me know in the comments. 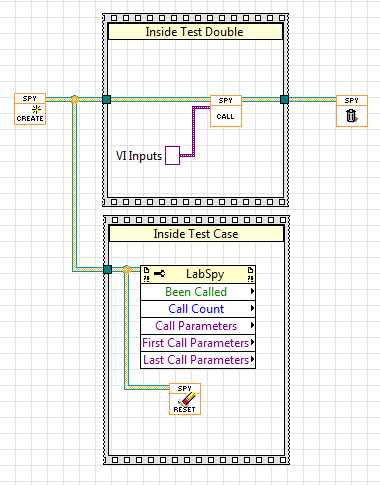 In my last post I covered how I am using unit testing in LabVIEW. In this post I want to share a useful tool on that journey. One of the first rules I operate under while testing is using as much of the real application as possible in testing a behaviour. Then each test becomes more valuable as it covers the integration of all the units as well as their contents. Sometimes however this simply isn’t possible. You may need to talk to hardware that isn’t available, or a database or file that is hard to verify as part of the test (It’s normally possible somehow, but perhaps not worth it). This is where test doubles come in. 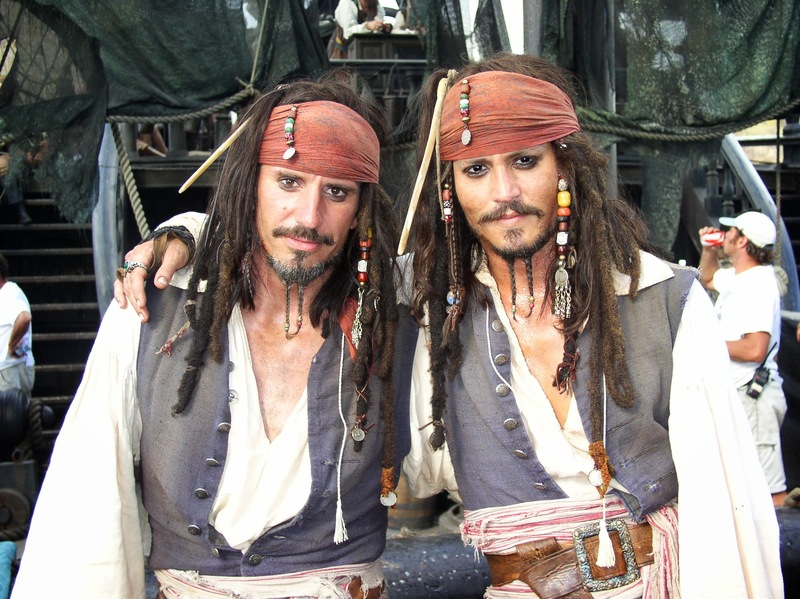 A test double is simply a substitute for a software component that you want to exclude from the test. In my last post I mentioned that OO make testing easier, this is why. If these components are written to an abstracted interface we can replace them with a double using dynamic dispatch. There are different types of test doubles that are well covered in an article by Martin Fowler. Without getting bogged down into terminology these can return canned answers, simulate some behaviour or simply act as black holes for data! One type is called a spy. A spy object is a way for us to peek inside an object. Essentially it is a double that stores information about how it was called so that you can query it later and make sure it was called in the way that you expected. For example if we are sending a logging library a value of 1 to log, we want to see that the file writing function was called with a value of 1 for the channel name for itself. Health Warning – Overuse of this can create very brittle tests. The advantage of taking a high level approach to testing is that your tests aren’t coupled to implementation details which will change more than behaviours. If you use spies too much and you see a lot of implementation details you risk making tests that frequently break and/or require more maintenance. So how do we do this in LabVIEW? Because LabVIEW is a compiled language we must specifically implement new components that contain the spy abilities. Essentially this component must be able to store the details of each call in a way that it can be read back later. You can do this however you like! But I have created a library to try and take some of the hard work out of it. By creating these spies inside of your class you can create a spy class that you can use in your testing. Create a setup and delete spies method which can be called in the setup and teardown of your test. Make sure the references they create are accessible (either output as an indicator or make accessible through another accessor). Create the override methods and add the register calls. If you want to track input parameters create a type def for them and wire into the parameters input of the register call function. Write the test and check the calls using the LabSpy API. The image below shows a simplified diagram showing what this could look like. Now you can check that your software is making the calls with the correct parameters. This project is released under an open source license and you can find it on my github account at https://github.com/JamesMc86/LabSpy. There is a VI Package so that you can install it into the palettes which you can download from https://github.com/JamesMc86/LabSpy/releases. Feel free to download it, play with it, suggest fixes or add feature that you would find useful. This LabVIEW blog provides advice on development best practices and tips from the experts at Wiresmith Technology. Find out more on our about page. Refactoring: When Should I Create A SubVI? – Alliance of LabVIEW™ Architects. on Refactoring: When Should I Create A SubVI?